One of the astounding things about Islamic extremists is that, with astonishing regularity, they tell you exactly what they are thinking. Want to know what targets ISIS intends to hit next? Watch the videos they release with great regularity. Want to know what the Islamic Republic of Iran is up to inside the United States? 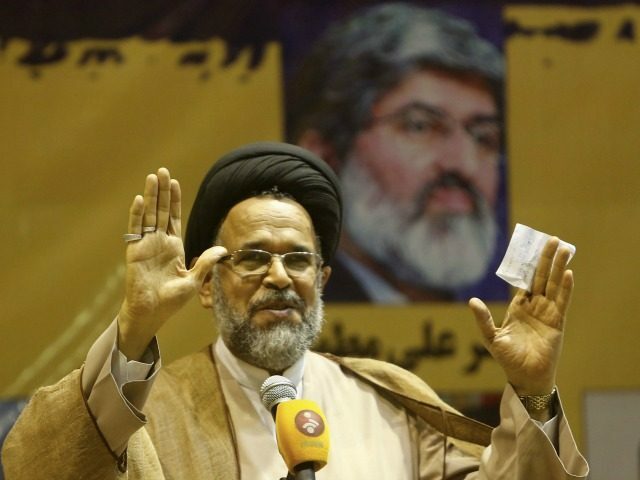 Listen to the Iranian Intelligence Minister, Mahmoud Alavi. Speaking earlier this year, Alavi discussed at length the activities of what he called a pro-Iranian “lobby group” in Washington, DC, which clandestinely pushes a pro-Iranian agenda and spreads its ideology. As per Alavi, this lobby is working to bolster the regime’s international status and help legitimize its nuclear plans and programs. Alavi did not go so far as to name the lobbying group in question, but one of the leading candidates must be the National Iranian-American Council (NIAC) founded by Trita Parsi, an activist born in Iran who claims to speak on behalf of Americans of Iranian descent. Despite Parsi’s claims to be a representative of Iranian-Americans and denying ties to the government, the activities of his group show that he reliably advocates in favor of Tehran and systematically avoids any criticism of the appalling human rights record of the mullahs in Tehran. In fact, instead of criticizing the Iran regime for its terrorist activities and inflammatory rhetoric, Parsi and NIAC blame tensions with Iran on America and the West. NIAC demands recognition of the legitimacy of the Islamic Republic and the abandonment of those fighting for democracy inside Iran. Parsi and NIAC also claim that the world’s leading sponsor of terrorism, Iran, wants to have a fruitful relationship with the United States and Western powers, including Israel. How this squares with the almost daily calls by Iranian officials for the elimination of the entire state of Israel remains unclear. The rhetoric remains the same. Iran is portrayed as a productive player on the world stage, a nation that should be engaged and encouraged rather than isolated. The reach of NIAC and Parsi is staggering. During the negotiations leading up to the catastrophic Iran nuclear deal, Parsi and Seyed Mousavian, the former head of Iran’s national security council, made over 33 visits to the White House to meet with senior American officials. During that timeframe, Sahar Nowrouzzadeh, a former member of NIAC, served as the Iran Director for former President Obama’s National Security Council (NSC). So it is perhaps not surprising that, when the deal emerged, it read as if it were drafted for Tehran’s benefit, not ours. Perhaps it was. At every juncture, Parsi and NIAC are sure to come to the defense of the Iranian regime and its allies. In the aftermath of the recent horrifying Syrian use of nerve gas on civilians that was almost universally condemned, Parsi criticized the American missile strikes. In February of this year, a group of 100 prominent Iranian dissidents publicly called on Congress to launch an investigation of NIAC and the groups associated with it. They complained that not enough was being done to expose the lobbying efforts of the Iranian regime and its intensive propaganda efforts inside the United States. We write to request a congressional hearing on the efforts of Tehran’s theocratic regime to influence U.S. policy and public diplomacy toward Iran. We ask that you launch an investigation into any and all lobbying activities of Iranian-American groups, which ostensibly promote the interests of our community but whose real goal is to undermine long-term U.S. national security interests in Iran and its neighborhood. No word yet on what if any response the letter will produce on Capitol Hill. What the future holds for the Iran Lobby now that Donald Trump is President remains unclear. Meanwhile, however, Tehran continues to reap the benefits of the pro-Iranian policies of the Obama Administration and the disastrous Iran nuclear deal. For example, despite the well-known practice of Iran to use “civilian” aircraft to transport troops, explosives, and weapons into Syria and other conflict zones, Boeing is poised to go forward with two deals for the sale of dozens of modern jet airliners to the Islamic Republic of Iran. Tehran’s fifth column, the Iran Lobby, has done its job. Charles “Sam” Faddis is a Veteran, retired CIA operations officer, former Assistant Attorney general (WA) and published author. With degrees from The Johns Hopkins University and the University of Maryland Law School, he is a Senior Contributing Editor for Homeland Security Today, contributor to SOFREP.com, NewsMax, and The Hill among others. He regularly appears on many networks as a national security and counter-terrorism expert. Sam also consults for the U.S. military and private industry. Sam is the author of “Beyond Repair: The Decline And Fall Of The CIA” and “Willful Neglect: The Dangerous Illusion Of Homeland Security.” More info at SamFaddis.com.